ORLANDO, Fla., March 17, 2017 /PRNewswire/ — Mazor Robotics Ltd. is a global leader in the development and distribution of innovative surgical guidance systems for spine and brain surgery. 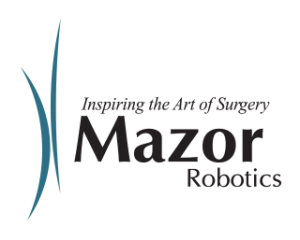 Mazor Robotics Inc., the US subsidiary of Mazor Robotics LTD is recognized as one of largest players in the robotics and simulation industry in the State of Florida, their US headquarters are in downtown Orlando. In nearby Celebration, The Florida Hospital Nicholson Center serves as the national training center for the new Mazor X™, a transformative platform for spine surgeries, having trained over 100 surgeons from all over the United States in 2016. “As a pioneer and a leader in the field of surgical guidance systems, Mazor Robotics saw two significant milestones in 2016: the launch of our strategic partnership with Medtronic followed by the commercial release of the new Mazor X™. We are very excited to see what 2017 brings for our company,” says: Christopher Prentice, CEO Mazor Robotics, Inc. Since signing the agreement in May 2016, Mazor and Medtronic have invested in co-marketing, promotion, and training efforts towards commercialization of Mazor X™, a transformative platform for spine procedures that launched in October at the North American Spine Society (NASS) Annual Meeting. Between the two companies, there are now hundreds of highly experienced capital and clinical specialists responsible for raising the awareness of, selling and supporting Mazor X.
Mazor Robotics (TASE: MZOR; NASDAQ-GM: MZOR) believes in healing through innovation by developing and introducing revolutionary technology and products aimed at redefining the gold standard of quality care. Mazor Robotics Guidance Systems enable surgeons to conduct spine and brain procedures in a more accurate and secure manner. For more information, please visit www.MazorRobotics.com.